A practical four-step methodology for any leader or manager facing a tough choice, and for creating integrative solutions to big, complex and pressing problems. Conventional wisdom-and business school curricula-teaches us that making trade-offs is inevitable when it comes to hard choices. But sometimes, accepting the obvious trade-off just isn't good enough: the choices in front of us don't get us what we need. In those cases, rather than choosing the least worst option, we can use the models in front of us to create a new and better answer. This is integrative thinking. First introduced by Roger Martin in The Opposable Mind, integrative thinking is an approach to problem solving that uses opposing ideas as the basis for innovation. 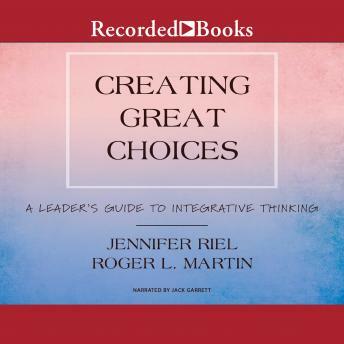 Now, in Creating Great Choices, Martin and fellow Rotman expert Jennifer Riel vividly show how they have refined and enhanced the understanding and practice of integrative thinking through their work teaching the concept and its principles to business and nonprofit executives, MBA students, even kids. Integrative thinking has been embraced by organizations such as Procter & Gamble, Deloitte, Verizon, and the Toronto District School Board-all seeking a replicable, thoughtful approach to creating a "third and better way" to make important choices in the face of unacceptable trade-offs. The book includes new stories of successful integrative thinkers that will demystify the process of creative problem solving. It lays out the authors' practical four-step methodology, which can be applied in virtually any context: - Articulating opposing models - Examining the models - Generating possibilities - Assessing prototypes Stimulating and practical, Creating Great Choices blends storytelling, theory, and hands-on advice to help any leader or manager facing a tough choice.